Today is kind of a bummer day for me. My mom and dad were supposed to be coming to visit. My dad had to cancel a couple of days ago but my mom was still planning on coming. I’ve been really looking forward to it for the past couple of months since I rarely get to see my family (they live in Idaho, I live in Texas) and since the last time they saw Sawyer he was just a newborn. But, alas, it was not meant to be (*sigh*). My poor mom missed her flight this morning and it would cost an exorbitant amount of cashola to get her on another one. So she had to cancel and my week has sadly become free again. To pick myself up after a teary and disappointed call to my hubby to tell him the news, I decided to make something. I’ve been meaning to make this mirror for a while and finally today I just DID IT. Even though the house is a disaster and I’m sure there are about a million other things that I should’ve done instead. About a month ago the kiddos and I took a day trip with my hubby’s cousin’s wife and kids to go see Papa and Granmama (my hubby’s grandparents) who live in a fifth-wheel down on the ocean. We see them quite a bit but its always them coming to see us (its about a 2 and a half hour or so drive) so I’m really glad Brooke (my hubby’s cousin’s wife) had the great idea to go visit them for a change. It was a great day, we ate yummy food prepared by Granmama and played on the sand with the kids. It was still pretty breezy and Peyton was the only one brave enough to go in the water but still it was a good day. I spent some time walking up and down the beach picking up shells and driftwood knowing that I would eventually want to use them in a project(s). Papa teased me because all he saw was a “pile of dirty sticks”. :) When you are picturing this man, imagine him talking in a thick, nearly unintelligible, southern accent…look Boomhower on that show “King of the Hill”. Anyway, I’m glad I brought some things home. I love that we are so close to the ocean here and I’ve been wanting to put something somewhat beachy in our home. This did the trick I think. Pottery Barn’s driftwood lamp for $299. 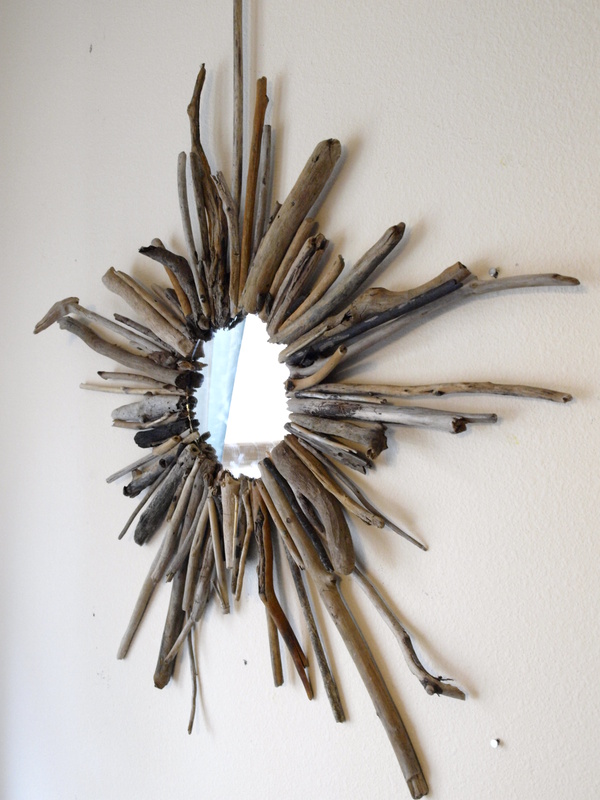 A driftwood mirror also from Pottery Barn for $199. A driftwood end table from Crate and Barrel for $399. 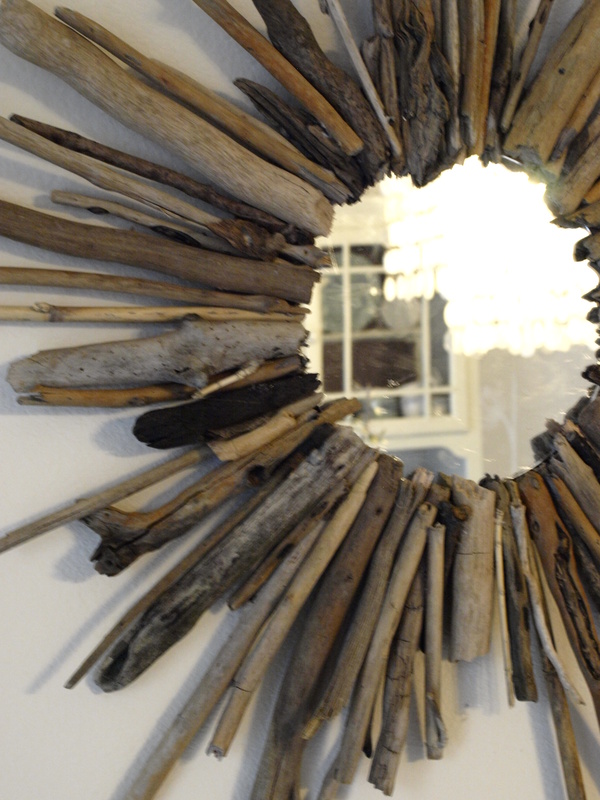 I love this and will have to keep my eye open for some LARGE driftwood pieces to bring home. Anyway, driftwood is just gorgeous and interesting in nearly every form. 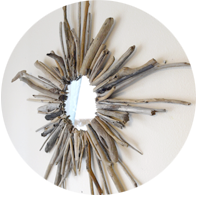 And, if you’re lucky enough to live near an ocean (or smart enough to haul some home from vacation) you can easily DIY some really cool driftwood decor and save yourself a few hundred bucks. 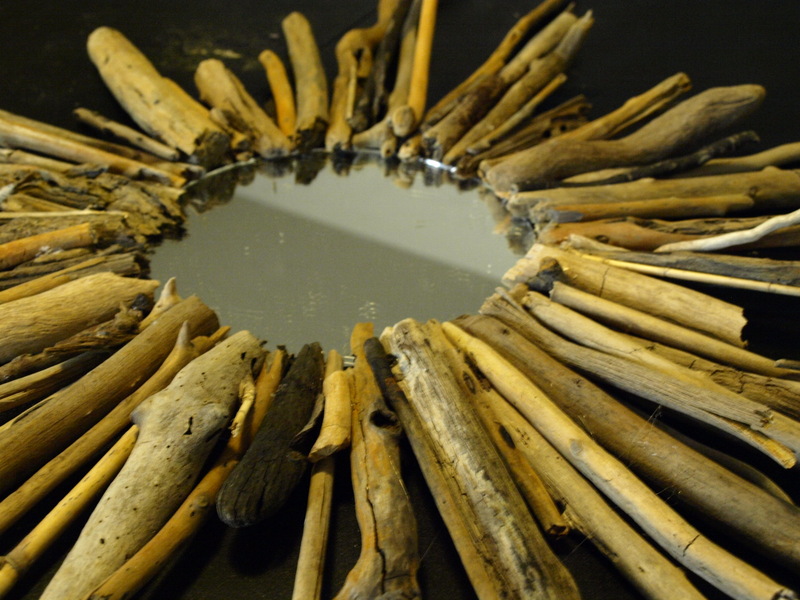 Plenty of driftwood sticks in different lengths shapes colors and sizes. A round mirror. I bought mine at the craft store in a pack of 3 for about $5 or so. A round wooden sheet. I bought mine at the craft store for about $1. Super glue. I used Quick Grip glue. This is super easy and pretty quick to make. 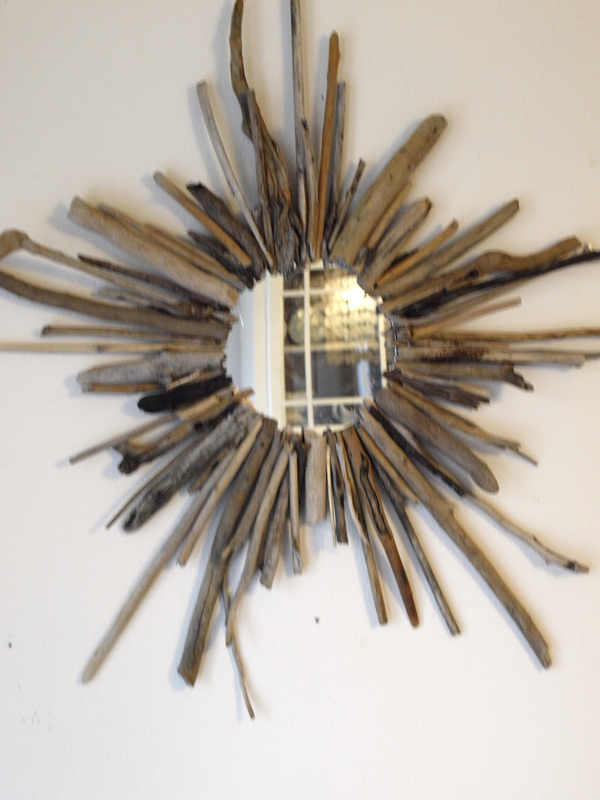 There are so many ways to decorate with driftwood and since I’ve been a little obsessed with starburst and sunburst mirrors lately I thought I’d try this idea out. 1. 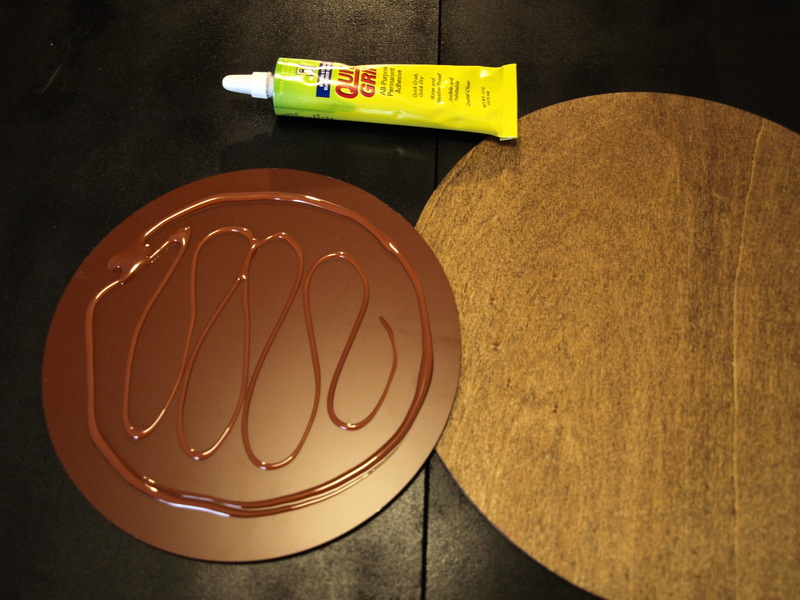 Stain or paint your round wood sheet a darker brown. I did this just in case parts of it showed through the driftwood. It was originally a really light wood color and staining it darker helped it to blend in. I had the stain on hand but you can also just give it a light coat of brown craft paint if you’d like. 2. 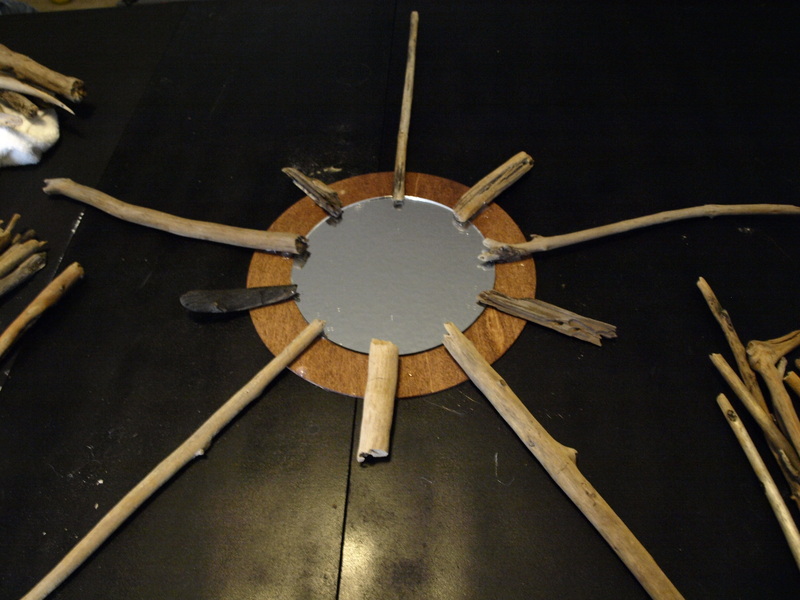 Once your wooden sheet is dry, glue your round mirror in the center of the sheet. I used Quick Grip super glue to make sure it will hold up. 3. Now, find your longest pieces of driftwood. I used 5 pieces as my “points” to my starburst mirror. If your sticks are not generally the same lengths, cut or break them down so they are closer to being the same lengths. 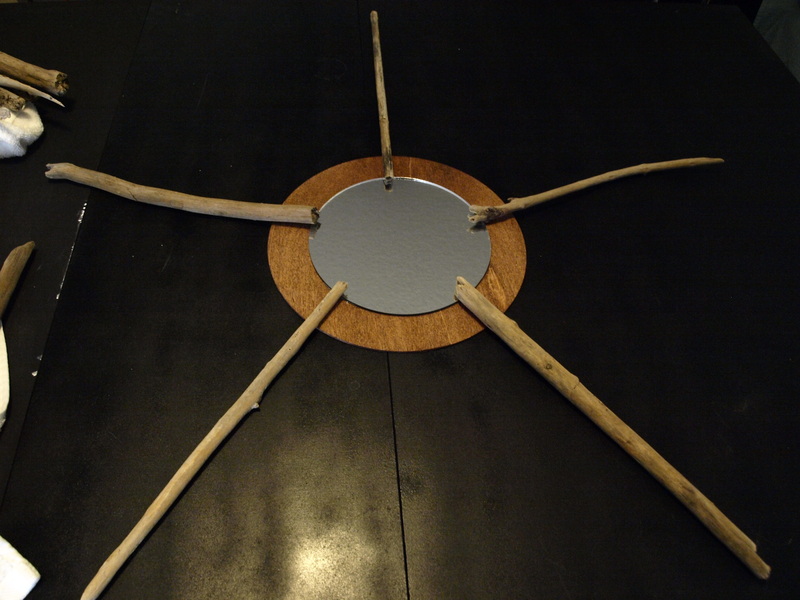 Arrange the 5 longest sticks around your mirror in a star formation. If you want to be really precise I suppose you could measure the distance between each one to make sure they are perfectly symmetrical. But you know me by now, I typically am not that patient so I just eyeballed it. When you get them to where you think they look best, glue them down to your board and mirror a bit with hot glue. 4. Next find your shortest pieces and lay them out in between each long “spire”. Glue those down. 5. 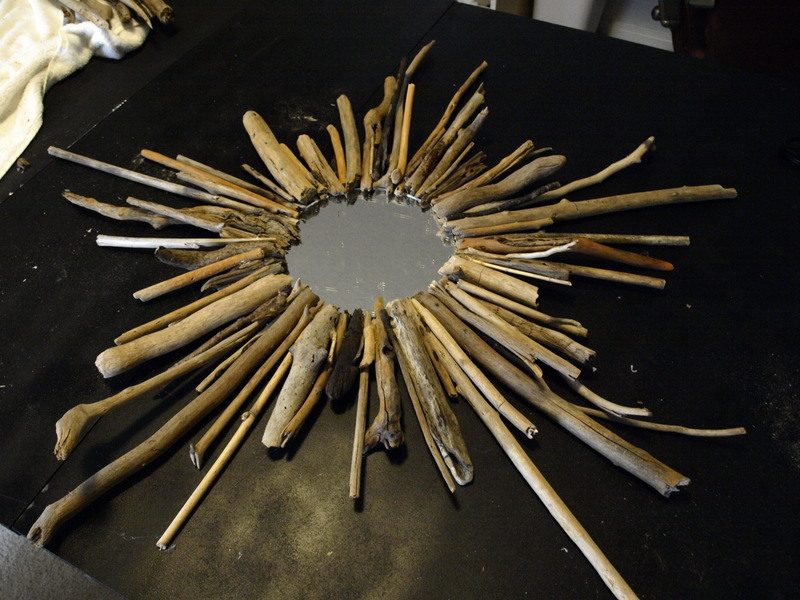 The rest is basically just filling around the mirror by gluing down the remaining driftwood. Try to taper the pattern from the longest sticks to the shortest and back up to the longest at each “spire”. Did that really make sense? You can catch my drift (haha…I’m lame) from the pictures. And thats it! Ain’t she a beaut! I plan on decorating my dining room this weekend and think that it will look great in there with my awesome $25 capiz chandelier from craigslist! I’ll get pics up when I get it all done! Have a great weekend! P.S. Wash your driftwood off thoroughly and let it dry again completely before you glue them down so that the glue will stick and you won’t get sand everywhere. This is probably obvious but I actually was all ready to start gluing my sticks on when I realized that I hadn’t washed them off and sand was all over my craft room. DUH. *TIP* For a more “beach cottage” feel you could “whitewash” your driftwood with a watered down coat of white craft paint.